Love, Lenore: fan fringe fever. Here is a simple, casual look for summer that's perfect to throw on for dinner and a movie, etc! I'm not going to lie, I pretty much styled this outfit around my new J. Crew-inspired fan fringe necklace, which I'm obsessed with! It was just $20 on Etsy with free shipping and I linked it above...I highly recommend! And speaking of jewelry, if your guy needs a little help with his gifting and you're trying to drop some hints about jewelry you might like, I came across a great article that's a guy's guide to buying jewelry, which you can find here. Based off of what I've observed from my dad and boyfriend, guys like a little help when making these types of decisions haha. 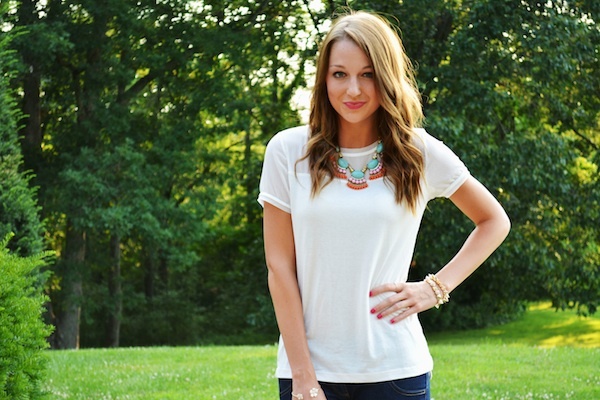 There's nothing better than a statement necklace paired with a tee and jeans. Such a simple, adorable look. Plus, those jeans fit you perfectly! Perfect outfit. LOVE that tee, it is so chic! AND of course the necklace is to die for - thanks for the link!! You look gorgeous! I love your necklace its so pretty! I've been wearing this style of jean a lot lately with wedges. It's just so summery! I was so excited to see this outfit since you posted a photo of your new necklace! I'm so in love with it, I may just have to buy one for myself! That necklace is soooo gorgeous! 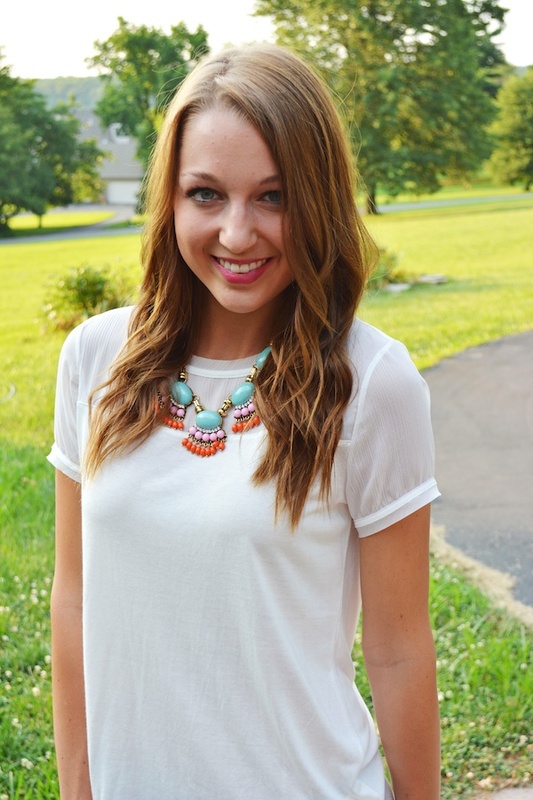 I love how a statement necklace can totally dress up a simple outfit! Love this look! I just saw that necklace at TjMaxx today for $29, so you got a fabulous deal! That necklace looks gorgeous on you!! Love the bright colors, great for summer! adorable! definitely perfect for summer! Jacy I've built my outfit around an accessory too;)!!!! It's funner that way! What a gorgeous find at such an amazing price! Love the look girlie! Me encanta el protagonismo del magnífico collar!!! Guapísima!! Loving your necklace so much and cute pants!